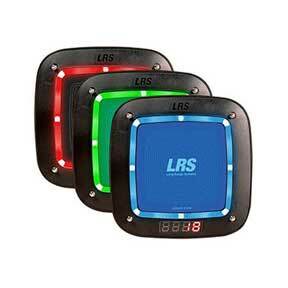 LRS new technology - the industry standard pagers - raised. As well as features from the worlds best coaster pager we've added some incredible new features. No longer is this product just a passive pager (as all competitive products are) but we have added new message acknowledge features to the CS7 and CS7 Note. Your paging system (or you) will no longer think that a customer has received a page when in reality they did not. This renders all competitive customer paging systems as redundant. Now your system any you will know when the message reached the customers CS7 coaster pager with no guesswork involved. This is a unique feature in the industry and the biggest innovation in 25 years and only available from LRS. While the CS7 Pro may look similar to other pagers, these newly developed coaster pagers use some of the very latest technology available in any pager. Other features include being able to choose the colour of the pager from red, green, white or even multi-colour operation, in fact a colour to suit any decor or branding. And remember there is still the ability to choose optional custom labels that take account of your own branding. Lastly this all new CS7 pro coaster pager is extremely robust and has been designed to account for all industries where we sell the device and some of the very tough environments where these coaster pagers are used. The CS7 is designed for today's business using tomorrows technology for a no nonsense, low cost solution wherever customers need to be recalled. These products are used throughout the United Kingdom in some of the UK's most well known brands. These companies buy from LRS because they know how incredible our products and service really are. The trusted guest pager, completely reimagined, gives you more control. We invite you to be amongst the many users to experience our new guest pager design. Reinvented The cleaner design is more durable, sleek, and reliable. Your customers will love the bold new look. Intelligent and Clever Uniquely acknowledges then confirms in the system when a call is received gives you the complete trust in the solution needed to run a smarter business. Nothing compares at any price from anywhere. Adaptable Unique ability to program it yourself. Setting pager numbers on the fly, and integrate it with other crucial operational aspects of business. Yours Light up your creativity with multi-colored LED lights. Coupled with your brand, you can truly make this pager your own.